What does development mean, and how can it be achieved? 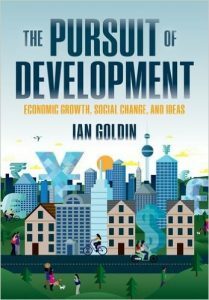 The Pursuit of Development: Economic Growth, Social Change and Ideas, was published by Oxford University Press in May 2016. The Pursuit of Development provides a concise account of what development means and how it can be achieved. It draws on scholarly and policy debates to show how nations escape poverty and achieve economic and social progress. The book identifies how our understanding of development has changed as the pendulum has swung from arguments for state-led development to a preoccupation with market forces. It examines the role of governments, international institutions, business and civil society, and explores how the notion of development itself has evolved from a preoccupation with incomes and economic growth to a much broader understanding of development. The Pursuit of Development considers the evolving role of finance, trade, migration and other flows to development. The contributions that education, health, gender, equity and other dimensions of human well-being make are also examined, and Professor Goldin demonstrates why it is also necessary to include the role of institutions and the rule of law, as well as sustainability and environmental concerns. Also available in Spanish and Romanian translations. “Anyone interested in development should read The Pursuit of Development. Development remains the greatest challenge for humanity. Drawing on his remarkable experience, Ian Goldin looks both back and forward to address the remaining old and the many emerging challenges, including rising inequality and climate change. I strongly recommend this immensely readable, timely and vitally important book”.